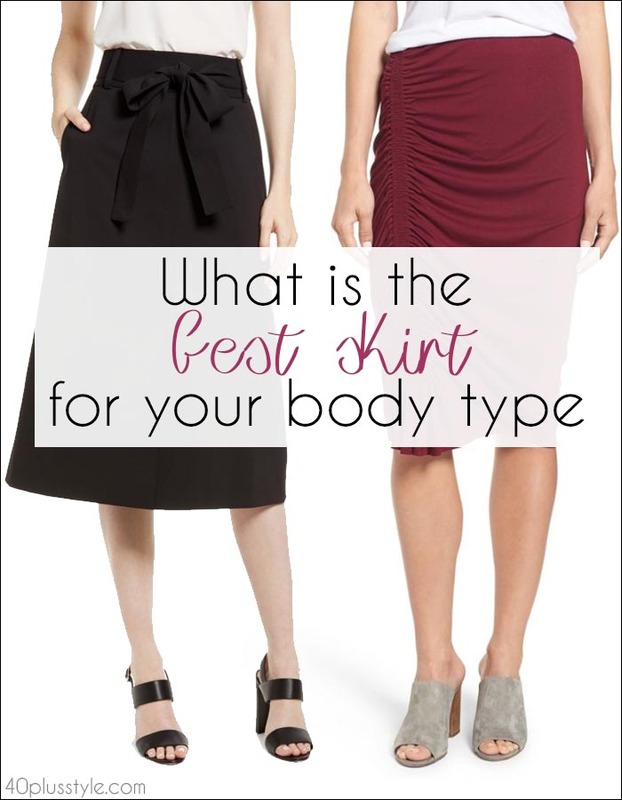 What is the best skirt for your body type? 40+ Style » How to dress for your body type » What is the best skirt for your body type? 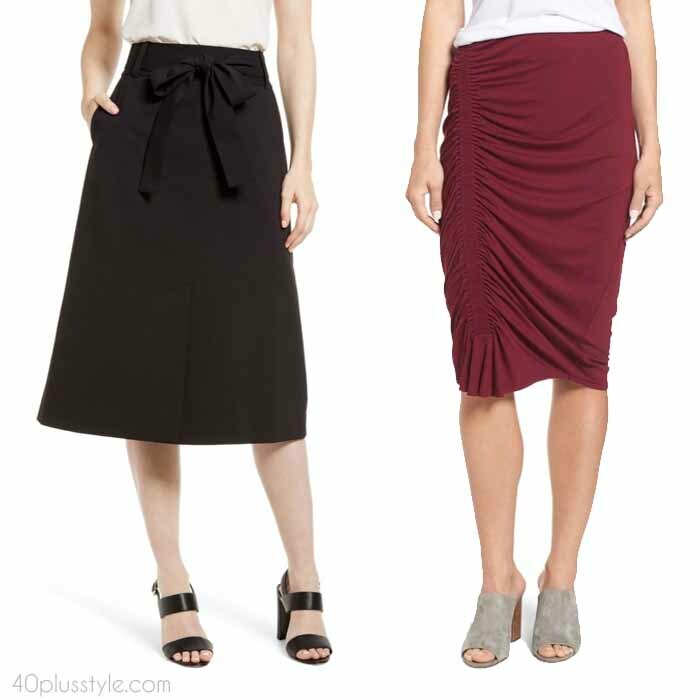 Finding the right skirt to flatter your body type can be tricky. Because, no matter what type of skirt you choose, a skirt always has a defined waistband, which can work better for some of us than for others. It can seem easier to figure out which top or which dress to choose for your body shape, as you can opt for a dress which totally skims over the waist, or which hugs it. But, obviously, your skirt must fit around your waist!! But, there are still lots of tricks, tips and choices when it comes to skirts. There’s a skirt type to suit every body type, whether you opt for knee-length, midi, A-line, pencil, denim, maxi, asymmetrical… the choices are endless. Here’s how to choose a skirt to flatter your body shape! If you’re an apple shape you carry your weight around your middle, but are likely to have great legs! It can be easy to wear a dress as you can opt for an A-line which simply skims over your midriff, or you may also suit an empire style which has its narrowest point just below your bust. But, it’s definitely possible to find some beautifully flattering skirts too! Look for a high-waisted option which fits at the slimmest point of your torso, rather than hugging your midriff where it is at its widest. 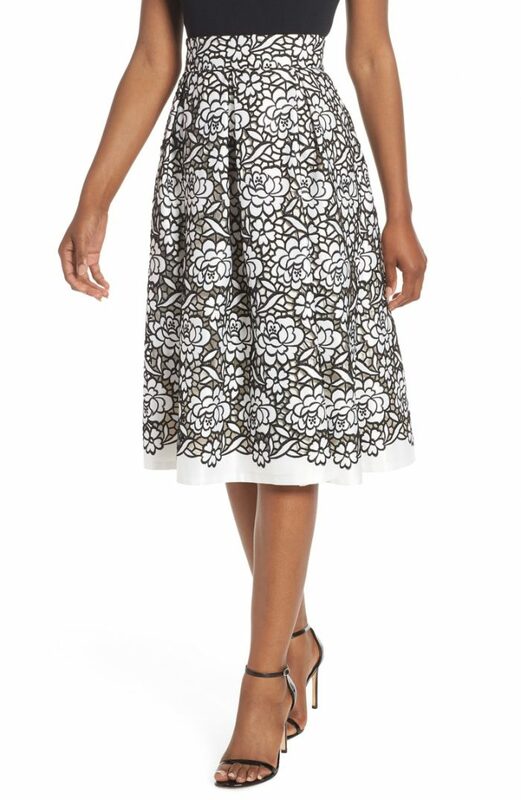 A flippy, flirty, flared skirt will look beautiful on you. Keep it just above the knee as if your skirt is too short, it will create a top-heavy effect. Don’t go too long though – you want to show off those fabulous pins! This one by Eliza J could be a good option as it sits high on the waist and the floral pattern will detract from any lumps or bumps. You could opt to wear a black top and team it with a statement necklace, so the focus in on your neckline and your skirt rather than your midsection. When you think about dressing for your body shape, the idea is usually to create that coveted hourglass shape! So, if you’ve already got those curves, flaunt them! A pencil skirt will smooth out your thighs while showing off your beautiful shape. 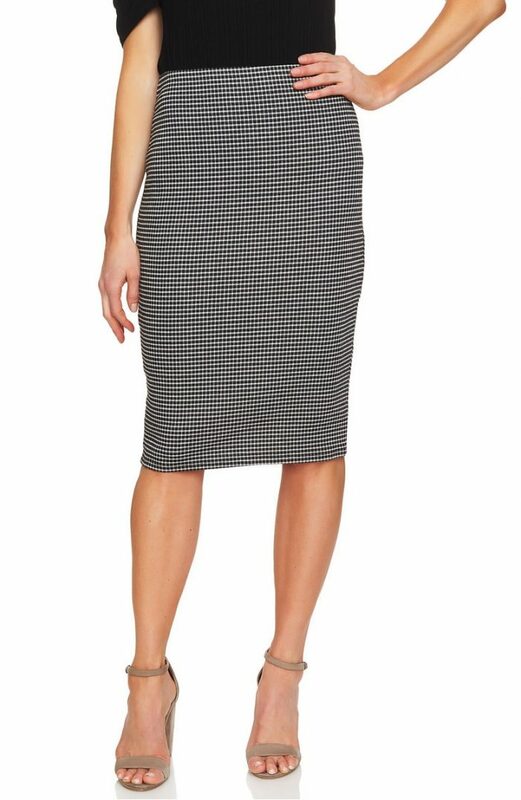 You could opt for a classic neutral shade like black or taupe, or go for subtle checks like this pencil skirt from Cece. If you’re a rectangle, then you have lots of choices. You could either go for a form-fitting pencil skirt to hug your svelte figure, or you could opt for a voluminous shape such as an A-line or a full midi to create curves. 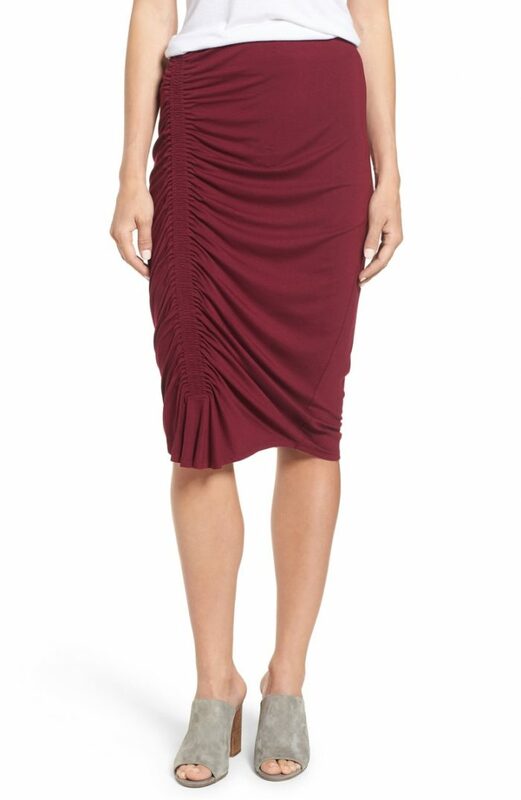 This Vince Camuto ruched pencil skirt will create some extra curves and some volume on your hips. If you’re a pear shape, your bottom half will be wider than your top half. 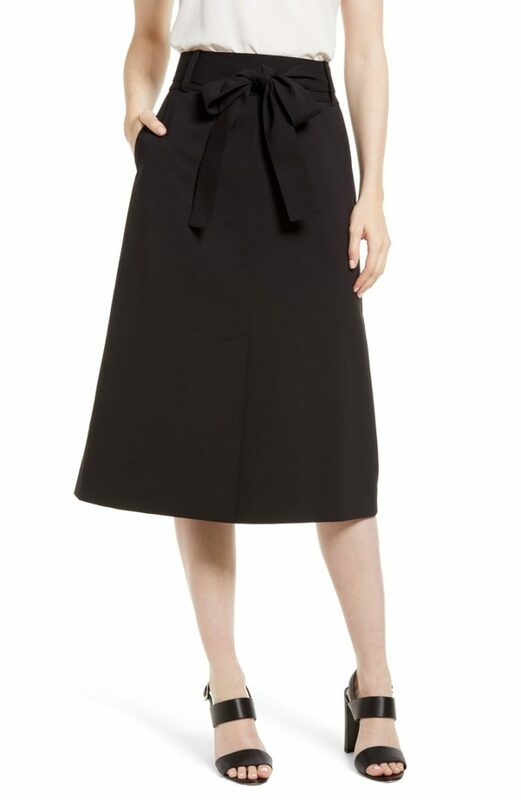 To create balance, an A-line skirt like this tie-waist skirt from Emerson Rose will accentuate the smallest part of your waist and flare out over your hips to minimize your lower half. Choosing a skirt in a darker color will also help to slim your hips and thighs. See how Sylvia wear a similar skirt in this article. If you’re an inverted triangle, then your shoulders will be wider than your hips. By choosing a flared skirt like this pleated knee-length skirt from Nic+Zoe you can create width on your lower half and give the illusion of being an hourglass! Sylvia also has some great advice here on the perfect skirt length for women over 40. Do you choose your skirts to suit your body shape? What works best for you? Very informative article. Love it how you have covered all the body shapes. Very useful information.